"It's hard to take a bad picture of a beautiful bridge," insists Al Clark, professor of Mechanical Engineering. Perhaps. 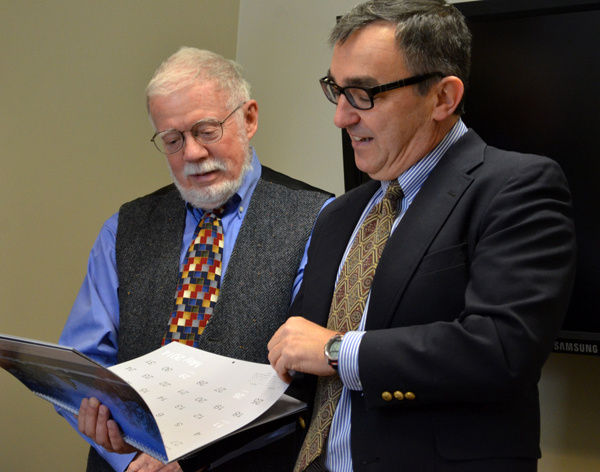 But clearly something more than just a good eye and steady hand were behind the four Clark photographs that now have a permanent home in the conference room of the Hajim School Dean's Office in Lattimore Hall. They reflect Clark's passion for photography for the last 65 years -- ever since he saved enough money delivering newspapers to buy his first camera at age 13. They reflect his love of American history. They also reflect an engineer's appreciation for the trusses, latticework and other components of our covered bridges and aqueducts. It is a testament to Clark's skill that his photos reflect not only the beauty of these unique old structures, but of their natural surroundings as well. 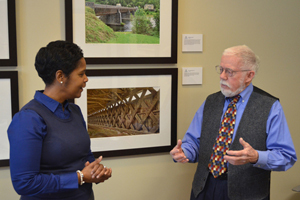 At a crowded reception, Sandra Turner, special assistant to the dean, said the photos were being enshrined in appreciation for Clark's steadfast support of the Hajim School's collaboration with the Memorial Art Gallery's annual Clothesline Festival. Dean Rob Clark inaugurated the school's presence at the festival as a way to celebrate the beauty in engineering and science. "Al has been our staunchest supporter, graciously contributing his bridge images for the school's tent," Turner said, noting that many people return each year specifically to see Clark's photos. John Lambropoulos, chair of Mechanical Engineering, noted that it should come as no surprise that engineers have talent and appreciation for the arts. "But you have taken this to really a high level," he told Clark. The photographer was clearly pleased that some of his favorite bridge portraits will be prominently displayed. "When I'm retired and sitting at home in my rocking chair, it will be nice to know there's still something of me here," Clark said. The Roebling Aqueduct that opened in 1849 to carry the Delaware and Hudson Canal over the Delaware River between Lackawaxen, PA and Minisink Ford, NY. It was designed and built by John Roebling, who later designed the Brooklyn Bridge. The Van Tran Flat Bridge built in 1860 across Willowemoc Creek at Livingston Manor, NY. The Downsville Bridge – the longest covered bridge in New York -- built in 1854 across the East Branch of the Delaware River in Downsville, Delaware County.